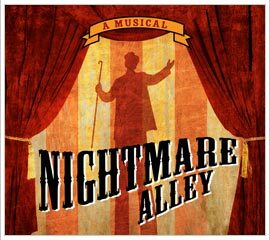 Nightmare Alley, based on a 1946 novel by William Lindsay Gresham, tells the story of Stan, a con turned carnie, who falls in love with Molly, the dark darling of the traveling carnival. Filled with freaks, geeks, lovers and fools, the show considers fate, free-will and the consequences that await when you make the wrong choice. Set in the dark, shadowy world of a second rate carnival, the novel was the inspiration for a 1947 film featuring Tyrone Power and Joan Blondell. When I first read the novel, I was so struck by the question of how someone sinks so low as to become part of a carnival freak show that I felt the need to put this story to music. After working closely with the Gresham estate and in recent years collaborating with Gil, I feel like we are truly ready to raise the big top and watch these fantastic characters come to life in all their revelry and tragedy on the Geffen stage. Directed by Gilbert Cates, the cast features James Barbour, Mary Gordon Murray, Larry Cedar, Michael McCarty, Melody Butiu, Leslie Stevens, Anise E. Ritchiem and Alet Taylor. It sounds like one to watch…. This entry was posted in Commentary, Musicals, Regional and tagged Alet Taylor, Anise E. Ritchiem, Commentary, Gibert Cates, James Barbour, Joan Blondell, Jonathan Brielle, Larry Cedar, Leslie Stevens, Mary Gordon Murray, Melody Butiu, Michael McCarty, Nightmare Alley, Regional, Tyrone Power, William Lindsay Gresham. Bookmark the permalink.